Life moves at a different pace in Sai Kung, Hong Kong’s remote ‘back garden’. This quaint seaside town in the easternmost area of Hong Kong takes a bit of effort to get to, since there is no MTR, but it is worth the long bus ride to explore everything this peninsula has to offer. 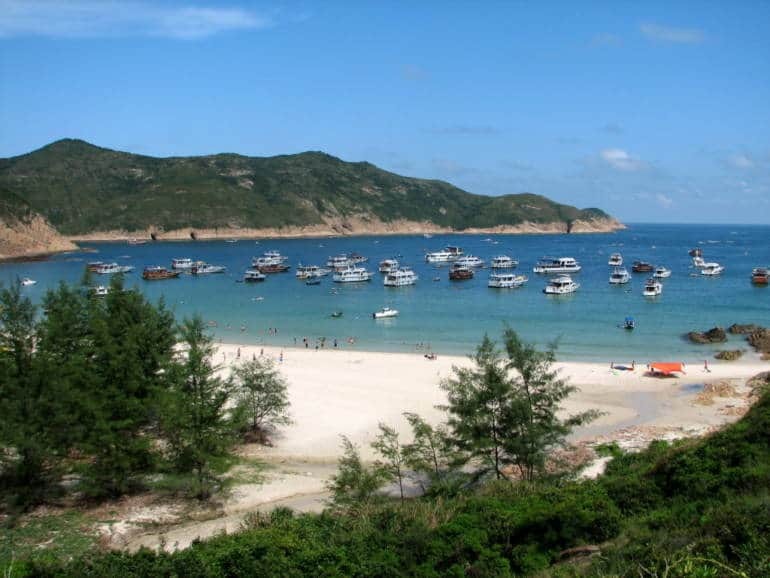 Sai Kung is where the locals go to escape the city and enjoy the water, so don’t forget your sunscreen and towel. 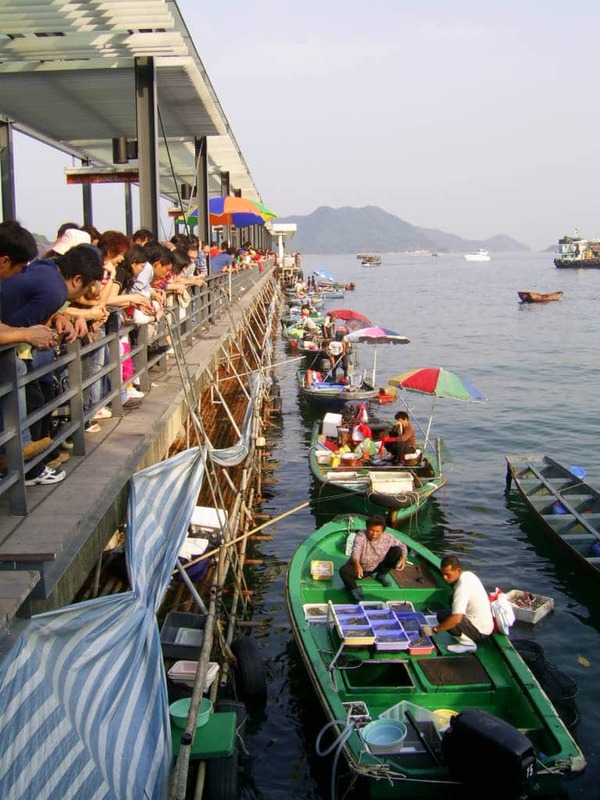 Sai Kung Town has a lively waterfront promenade where fishing boats and ‘sampan’ water taxis congregate, but the star attraction is Seafood Street, a floating seafood market. Customers line up on the pier to place their orders, which the fishermen ‘deliver’ up to the pier via long fishing poles. Al fresco restaurants line the water, and on weekends it gets crowded with people who have some very serious seafood cravings. Sai Kung’s remoteness means cleaner beaches and less water pollution, making it a mecca for water sports, including scuba diving, SUP, and jet skiing. If time is limited, from Sai Kung Pier you can catch a boat ride to nearby Sharp Island, where you can swim and enjoy the beautiful Half Moon Bay, or hike over to the tombolo which is only visible at low tide. One of the best experiences is to take a kayaking day trip to the Sai Kung UNESCO Global Geopark, with incredible rock formations, hidden coves, and untouched beaches—you won’t believe you’re still in Hong Kong. You’ll need a good guide; check out Kayak-and-Hike, which has been running these tours for more than 20 years. Sai Kung is the epicentre of junk boat trips in the summertime. Usually the full-day trip on these party boats includes unlimited bar and food, and takes you to explore the area’s untouched beaches. If you’re with a big group, you can charter the junk boat yourself for a private party. Most of the Sai Kung peninsula is protected country park, with awesome hikes that lead to secluded bays accessible only on foot. The MacLehose Trail takes you to the white sandy beaches of Long Ke Wan beach and Ham Tin beach, and if you’re truly adventurous, you can jump into the freshwater river pools of Sheung Luk stream. It’s all about the seafood here, and the restaurants that line the promenade in Sai Kung Town are a good place to start. Sitting at the waterfront is also a great way to see local life, including the people who dress up their dogs and take them for a fashion show on Sundays. Not into seafood? No problem—just head to Momentai, which, incidentally, means ‘no problem’ in Cantonese. This awesome pub run by Sai Kung locals has international grub, a pool table, and a waterfront view. Nearby you can also find Sai Kung Cafe & Bakery if you just want a quick bite and a cup of coffee, while Camden Town serves up British-style fish and chips and burgers. The beautifully renovated Conservatory has a Mediterranean menu, and you can get great sushi and donburi at Takka Fusion, including vegetarian options. To spend a night in this lovely but remote area, check in at The Pier Hotel, the only hotel in Sai Kung, and a 5-minute taxi from Sai Kung Town. It has a prime waterfront spot right by the Hebe Haven Yacht Club, and an outdoor swimming pool with ocean views of Pak Sha Wan Bay. Due to the lack of hotels, there is a proliferation of affordable and interesting Airbnb options. Many give you the chance to experience staying in a ‘village house’—an old-fashioned, three-storey home only found in the rural areas of Hong Kong. Some have fabulous sea views and are close to beaches. If you don’t mind roughing it, there are a number of youth hostels around the Sai Kung Peninsula. The Hong Kong Youth Hostel Association (YHA) operates two hostels in the area. The Pak Sha O hostel is located in the hills and great for hikers, but if you want to be closer to the water, the Bradbury Hall hostel is right next to the Chek Keng Pier.